Indian Science Congress Association was formed in 1914, and holds it’s meet in the first week of January every year. However this year for the first time in its history it held a session on Scientific practices in ancient India, which roughly covers the period from 2000BC to 500AD. The session had talks on Engineering applications of ancient Indian Botany that rather remarkably started with an attack on contemporary medical research by claiming how ancient Indian doctors claimed cancer cells were present in every human body and how today we do not even understand diabetes properly! There was a talk on Ancient Indian aviation technology which cited a book Vymanika Shastra as one of his main sources for the ancient Indian knowledge, perhaps not knowing that this book was thoroughly discredited in 1972 by three Indian Scientists from Indian Institute of Science who showed that none of the techniques described in the book and attributed to ancient Indian texts will allow objects to fly. There was also a talk on advances in surgery in ancient India. This was also the only session where majority of the talks were not delivered by Science faculties but by faculties of Sanskrit department, a retired pilot and a retired civil Engineer. These talks paint a picture of how in the ancient times, remarkable advancement in Science was made and the knowledge was either lost or made impure by advent of other religions like Jainism, Buddhism and of course Islam. 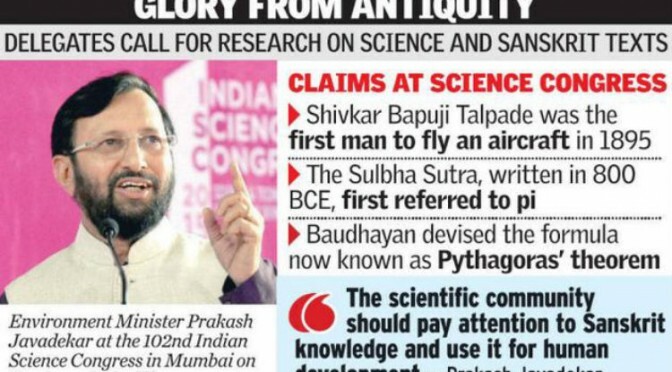 The idea to “revive” ancient Indian Science is not an isolated incident but is an element of a larger movement where Hindutva supremacy through supremacy of Brahminical intellect in ancient times is claimed. As is well known by now, a supplementary reading book prescribed by Gujarat State Board known as “Tejomay Bharat” is an encyclopedia of unverifiable and unsubstantiated information which covers a wide range of topics from ancient history to Vedic Maths to advancements made by Hindu Civilization in Scientific discipline. According to this text, Pakistan, Afghanistan, Bangladesh, Nepal, Bhutan, Tibet, Burma and Sri Lanka were all part of Akhand Bharat (united India) and this idea of Akhand Bharat is not merely ahistorical fact but a reality waiting to happen. On page 51 it says Akhand Bharat will first be enmeshed on the landscape of our dreams and emotions and then realise her form and shape in geography. The book is circulated in school free of cost and has chapters on Nuclear energy which states that a Sage called Kanada, who was founder of one of the six schools of Vedic Philosophy around 2500 years ago, was the one who discovered Atomic and Nuclear energy. The book goes on to claim that Germany stole this technology from us as they had six universities of Sanskrit studies in early twentieth century! And these universities fell in the hand of U.S. and it’s allies on one hand and Russia on the other when Germany was defeated. This is the reason why U.S. and Russia became nuclear superpowers. (The author of this comic chapter perhaps didn’t know about the Manhatten project and that U.S was a Nuclear power already by end of world-war Two.) This book written by Dinanath Batra who heads the educational wing of RSS takes the idea of ancient Hindu supremacy to another level altogether. So much so that the actual scholars of ancient India, like Aryabhata are not spared either. According to this book invention of zero precedes Aryabhatta by some thousands of years and it’s credit goes to two figures not known for their mathematical Prowess but their role in Mahabharata, namely Dushyant and Shakuntala! From Scientific point of view, all these activities seem laughable. None of these books or talks follow an actual scientific method of investigation but takes statements attributed to ancient sources at face value, a lot of which have already been scientifically debunked. However this coercion of Indian Science by ancient Brahminical (and hence Hindutva) scholarship is a rather serious development when viewed in the larger scheme of things. The Ancient Indian History is constantly being re-written by the RSS. In the three books titled Hindu Charmakar Jati, Hindu Khatik Jati and Hindu Valmiki Jati which were released last year, it is claimed that the Dalit caste and it’s 600 odd sub-castes were created by the Muslim Invaders and did not exist in the Hindu religion prior to Muslim Invasion. The idea of Temple desecration and forced conversion during Muslim rule has been inserted into the Indian Psyche so deeply that even by many liberals it is accepted as a historical truth. Whereas in reality the work of eminent historians like Richard Eaton which have debunked these myths is consistently ignored. Reviving Hindutva supremacy of the past is perhaps one of the most important aspects of RSS’s agenda. With BJP in power, they have clearly got the license to infiltrate the Indian academia and we are going to witness with increased intensity, the publishing of books like Tejomay Bharat. And with this coercion will come more such vedic nonsense as well as increased funding for institutions and conferences which promote this kind of Pseudo-Scientific research.